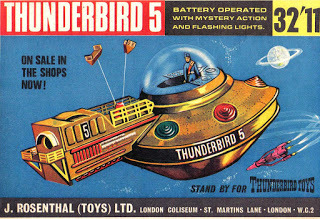 An image of a Thunderbird 5 poster, designed and made by my Grandfather’s company Jack Rosenthal Toys Ltd. It is a very timely post in many ways as I am going to London this weekend to attend my own family’s version of a Seder. Deborah’s description very much brought back memories of when my Grandfather was alive and the kind of stories he told. As an ex communist and active socialist his stories were often very much focused on fighting for a sense of humanity, for a greater equality across our British class system and against the forces of capitalism. Alongside this he was in fact a business man and an innovator having invented space toys for a mass market in the 1960s. He designed and made the first Thunderbird Toys. He set up the company J R Toys Ltd which later became Century 21 Toys, working with Gerry Anderson on his merchandising. I think about him and his innovative ideas, the contradictions of a business man who was a communist, an innovator at the forefront of TV merchandising and his dreams of rockets – as I embark on a new artwork, a new concept, collaborating with engineers, scientists, computer scientists – and sometimes games designers (through my work with Active Ingredient and Mudlark). I am having some incredibly interesting discussions about art and science within and outside of the University, which also link to the research about art and power, particularly in the context of academia and computer science. Much of this is about the role of art and indeed ‘humanity’ (or emotion) within science. It is also reflected in the development of a new version of the ‘performing data’ system (being developed by the Mixed Reality Lab and Horizon at the University of Nottingham) to capture, mediate and interpret data. This discussion returns to the questions I raised in my thesis about the integrity of scientific data and how we can mediate data to create humanised experiences and narratives around it – that remain grounded in science. The players are me (as an artist and researcher), a team of computer scientists, an engineer, two senior climate scientists and the group of people local who sign up to track climate change experiences within their everyday lives. I hope that we can capture these arguments and dialogues through the research, but also through the experience of the artwork – and I will be very interested to see how they relate to wider discussions and research about art and power.